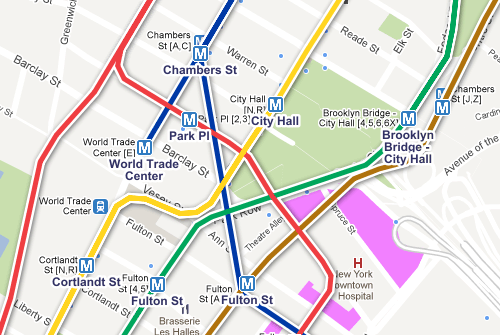 I previously wrote about showing the transit layer with the Google Maps API, this is somewhat of a continuation, but narrower in scope; here I’ll talk about showing custom markers for New York City subway stations, making use of data from NYC Open Data (formerly the NYC Data Mine). Replacing the point of interest indications with markers turned out to be fairly simple and the data from NYC Open Data was (relatively) clean and readily usable, a pleasant surprise given my previous experience. For this little project, I exported the Subway Stations dataset; it can be exported in a number of formats, but JSON is probably the easiest to work client-side. 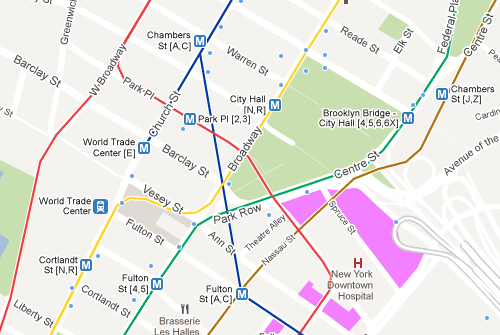 With the data readily available as a JSON file, it can be loaded simply with an AJAX call to get the file and, once loaded, the subway stations can be plotted on the map by iterating through the list of stations in the JSON data. (Note that these values are referenced by the field name, not a numeric index). 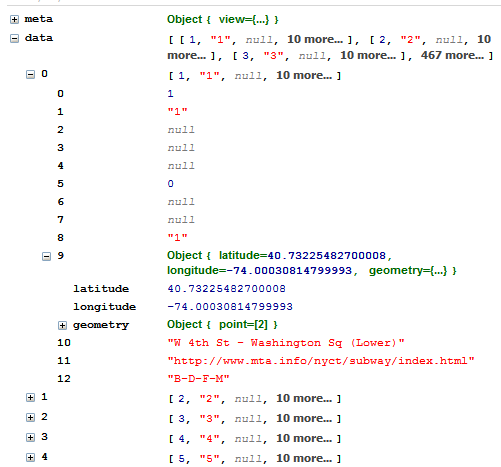 The code to get the JSON data (using jQuery’s .ajax), iterate through the array of subway stations, extract the relevant pieces of information about the stations, and create map markers for them is shown below. A label is attached to the marker by making use of Marc Ridey’s Label class. 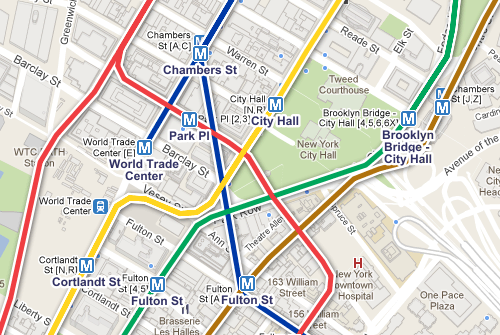 While Google Maps has a very useful transit layer (showing subway lines, bus stops, etc.) 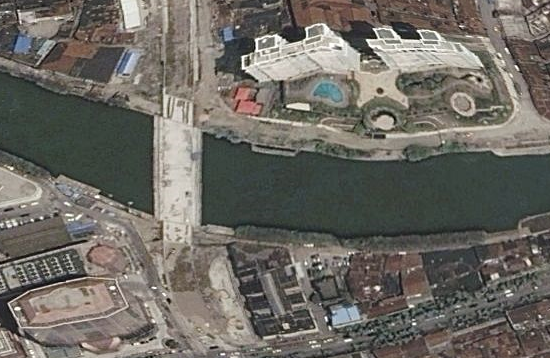 available when zoomed in on a city, this layer is unfortunately not exposed via the Google Maps API. However, as demonstrated on BlinkTag Inc. by Brendan Nee, it’s possible to load the transit layer as a custom tile layers, pulling the transit layer images directly from Google’s servers. 1. Custom styling applied to the base layer is lost. This is because full image tiles are loaded, which completely obscures the lower layer. A solution to this is to find and copy the apistyle and style URL parameters when the base layer is loaded (you can do this by looking at the GET requests with a tool like Firebug). You then simply add these paremeters to the URL returned by the getTileUrl() function. In New York City at least, it’s impossible to identify train lines by color alone, so it’s fairly important to see the letter or number identifier for trains at the different stations. The map has both large and small markers for each station, but only the small markers shows this information. I couldn’t figure out a way to get the larger marker to show the letters/numbers, but by changing “vm:” to “vm:1” you can completely remove the large markers from the map. However, this also shrinks the size of the lines indicating the train routes. There is a third issue that’s pretty noticeable as well: bus stops do not how the identifier of the buses that stop at them. I’ve yet to find a way to show them. 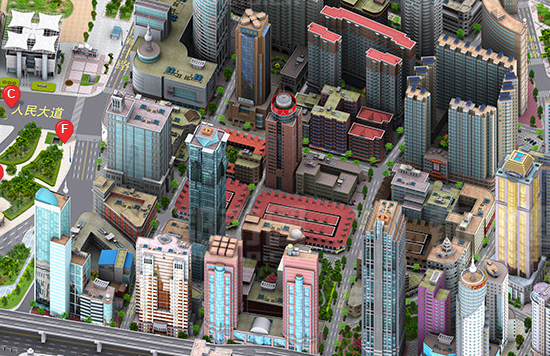 Truly impressive: Baidu (“the Google of China”) doesn’t use satellite imagery for its maps, instead it uses isometric, Simcity-style sprites. It’s beautiful to look at, and with the crystal clear delineation of buildings, roadways, and landmarks, it’s likely a very effective navigational tool as well. The sheer scale of this blows my mind. I can’t even begin to fathom how much time and effort went into creating this much artwork to paint an entire city. 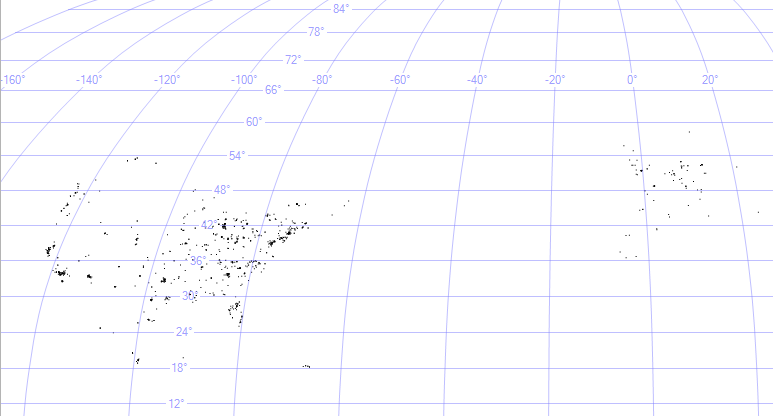 Something pretty cool in MSSQL Server Management Studio: for columns with the geography data type, Management Studio will plot the points on a map. 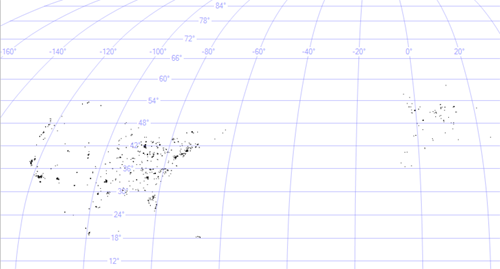 Here’s a map of all locations tagged from all dotspott users.